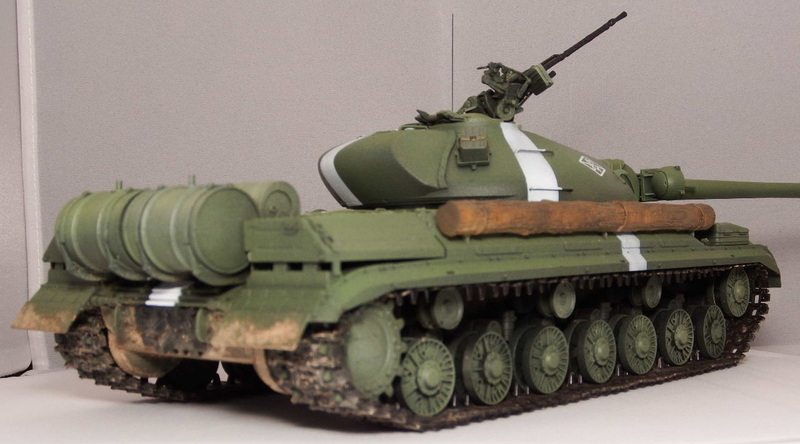 It was Sunday the 26th July and I was visiting the IPMS Birmingham Show with our Club Display. 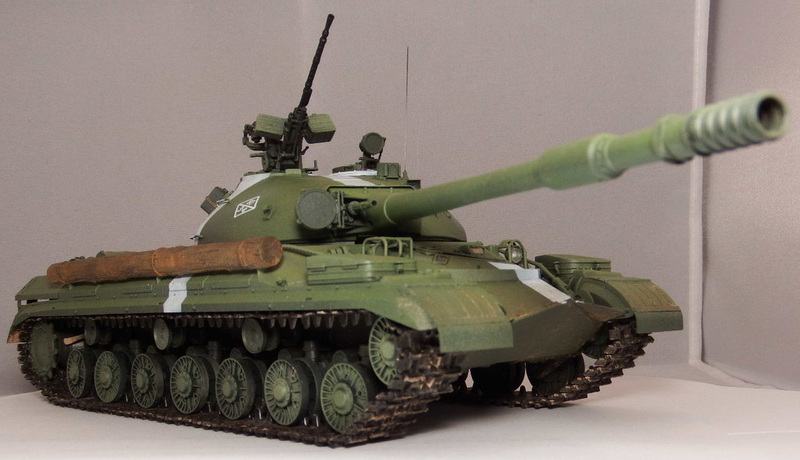 I knew the T-10M was out so I made a b-line for Phil on Mainly Military Models and WOW! 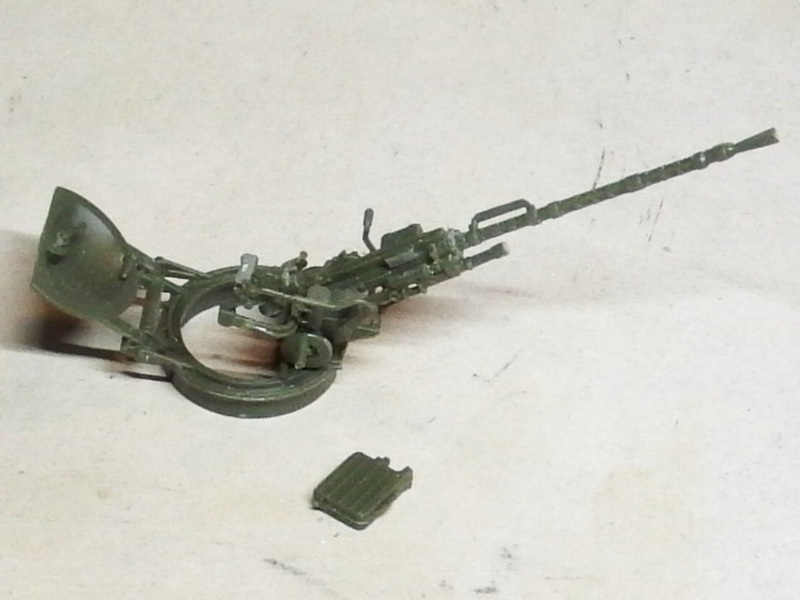 he had BOTH, the Trumpeter and MENG kits - Result! 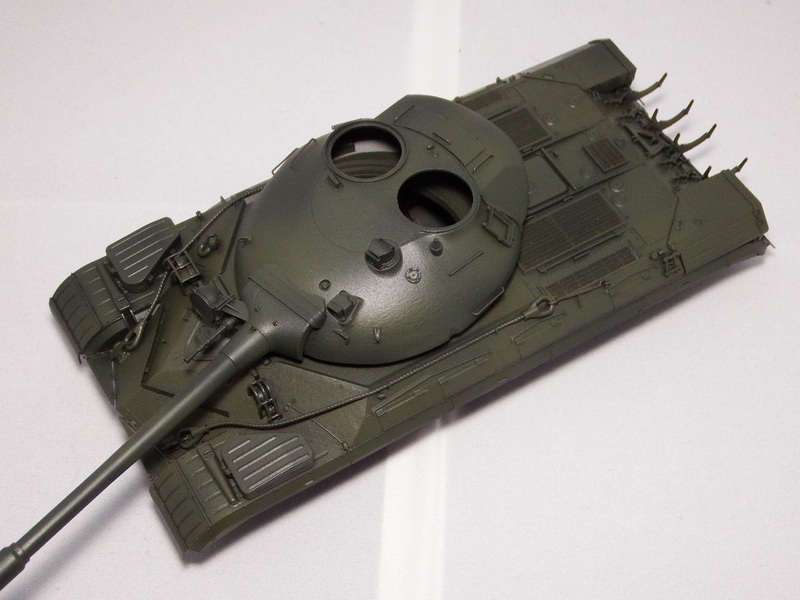 I thought.After doing an in-box assessment of both kits the MENG model won out for me. 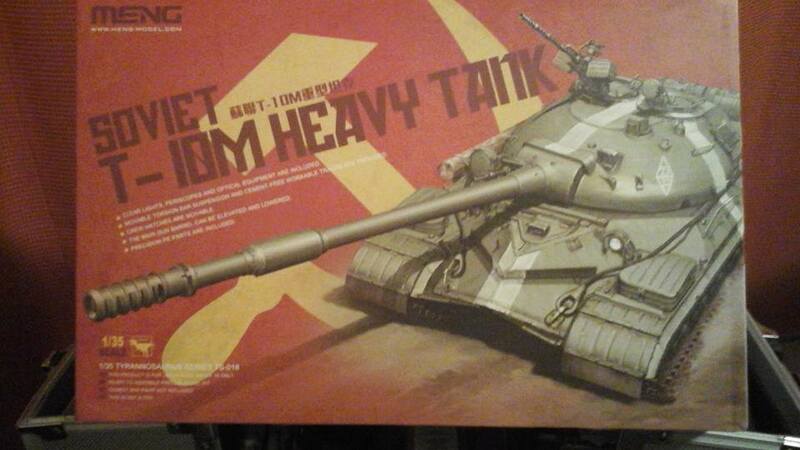 The MENG Kit at an RRP of £49.99 it is not to be sniffed at but this will build into a very impressive, and very large model. 1. Solid box-art, strong box and deeper than Trumpeter by 50%. 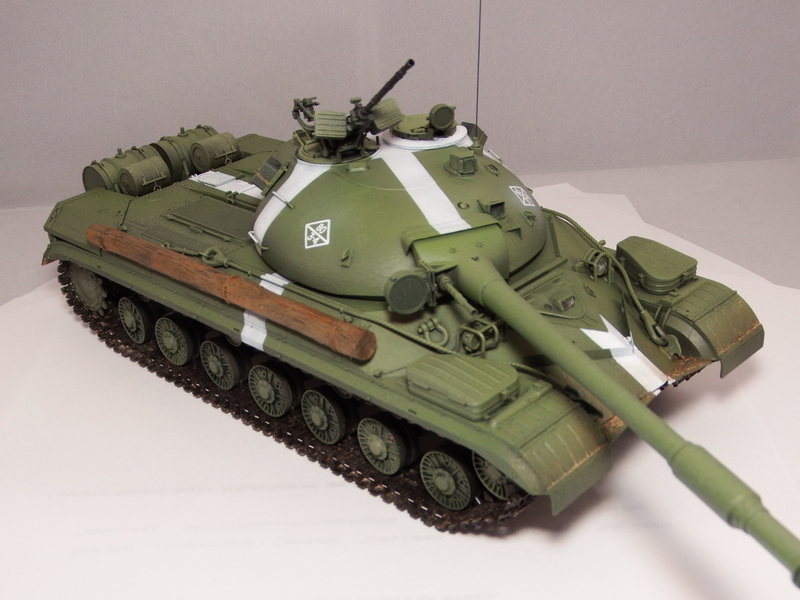 This model has 2 decal options for: 1st Guards Tank Army, Berlin Parade 1960 and 13th Guards Heavy Tank Division, 1st Guards Tank Army, Operation Danube 1968 (invasion of Czechoslovakia a.k.a Prague Spring). 2. 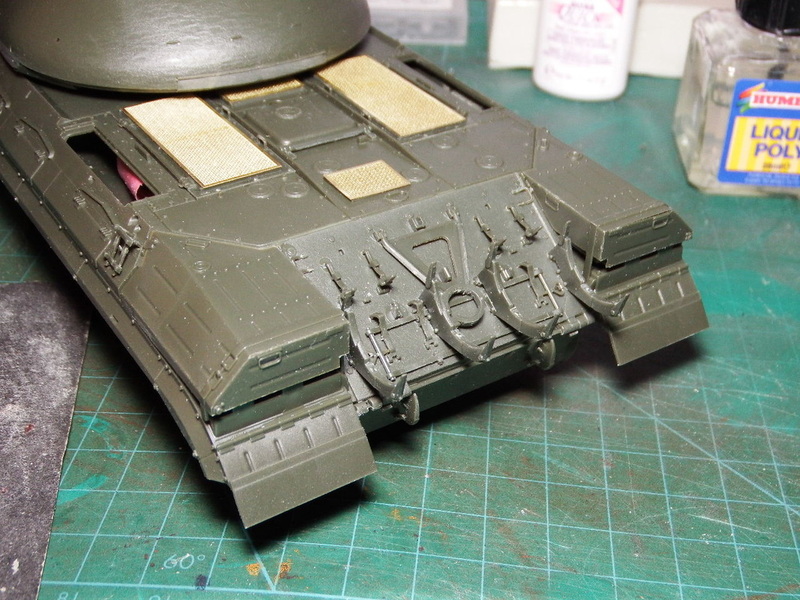 Good Cast texture on the lower Hull gets this build off to a good start. 3. 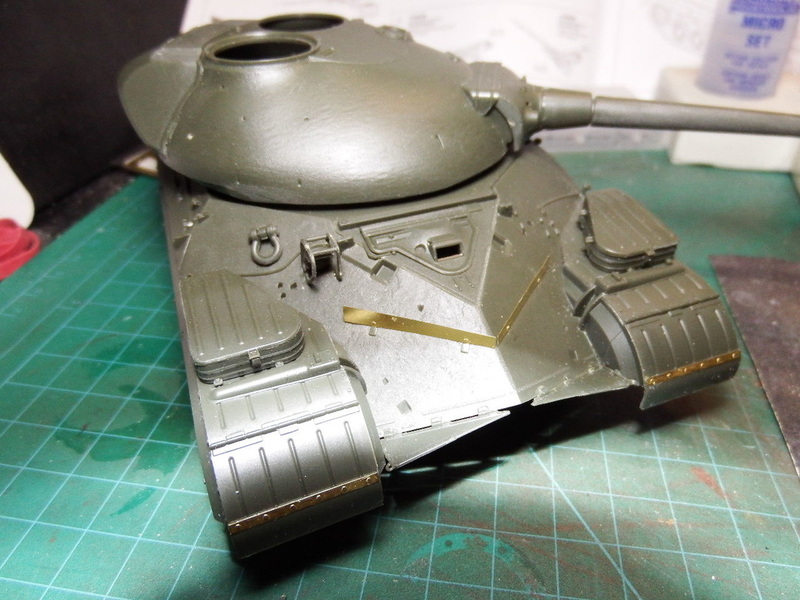 The first parts added, most of these are molded in on the Trumpeter kit. 4. You can see here that the Torsion Bars ar quite short and this provides for a stiffened suspension. 5. With all the Road Wheel Arms added I tested their effectiveness and was pleasantly surprised. 6. By only anchoring the Road Wheel Arm at the squared end, you get an operation set of suspension arms. 7. 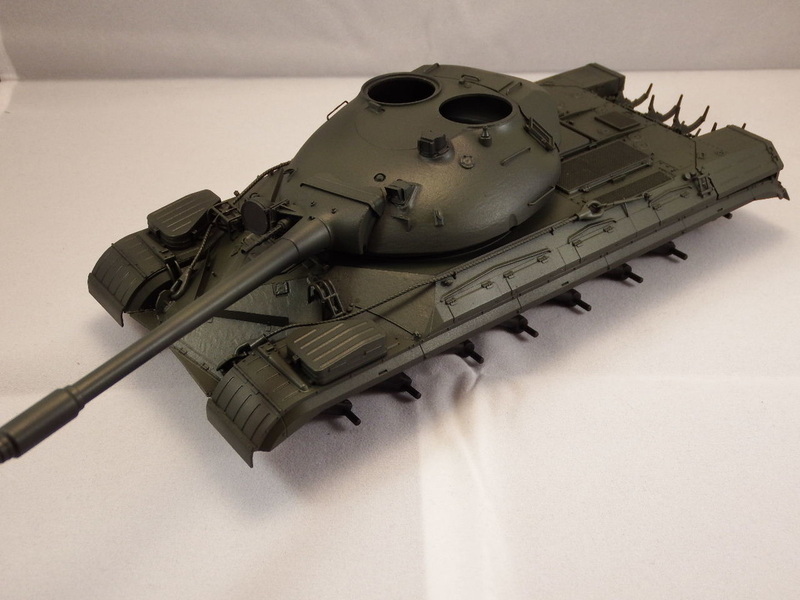 With just the Upper Hull placed on, the footprint of this model is L 205mm x W 97mm - Impressive and comparable with the JS-7. 8. The Drivers position - no interior detail - has a snug fit and no seam lines. Glue was applied from the inside. 9. 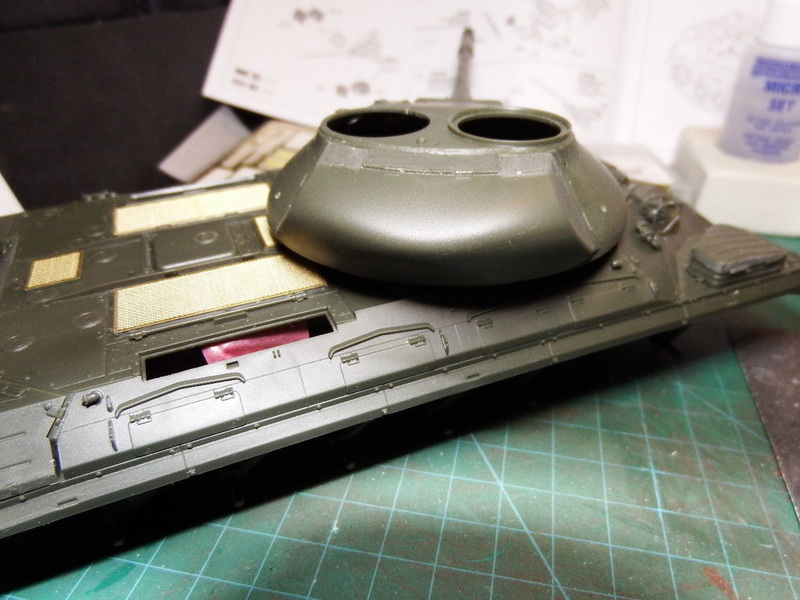 With the basic Turret added, this is starting to look imposing. No need for any filler yet! 10. 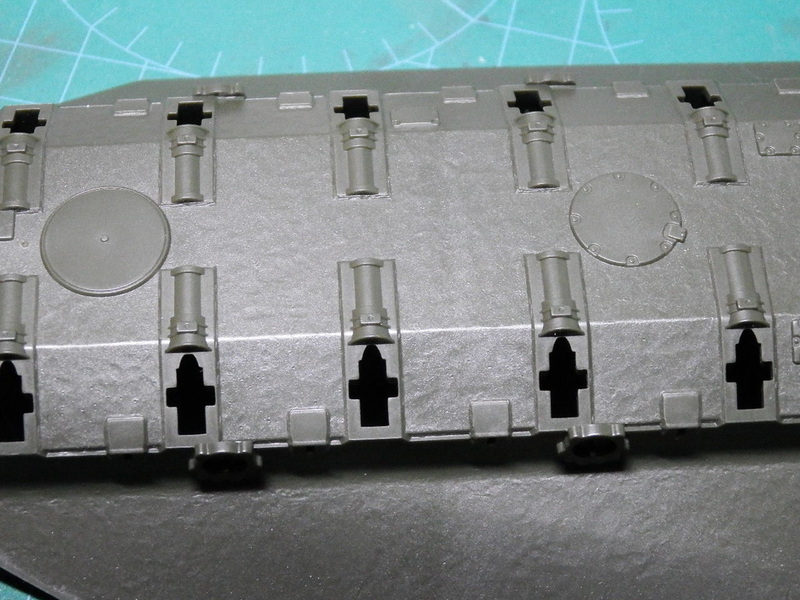 The rear deck has quite a few parts but the instructions are fairly straight forward. However, take a good look at them before you go charging ahead. 11. 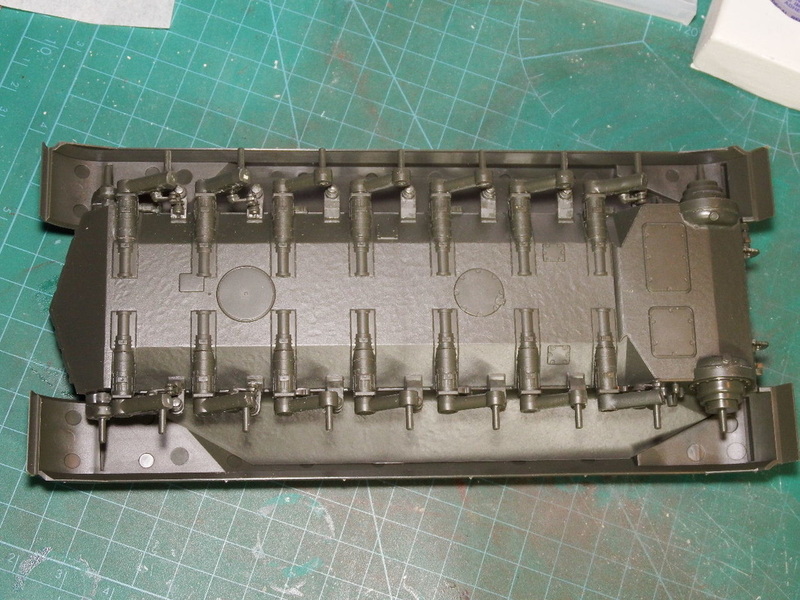 Now with the upper and lower hull sections glued it's on to the engine deck grills. 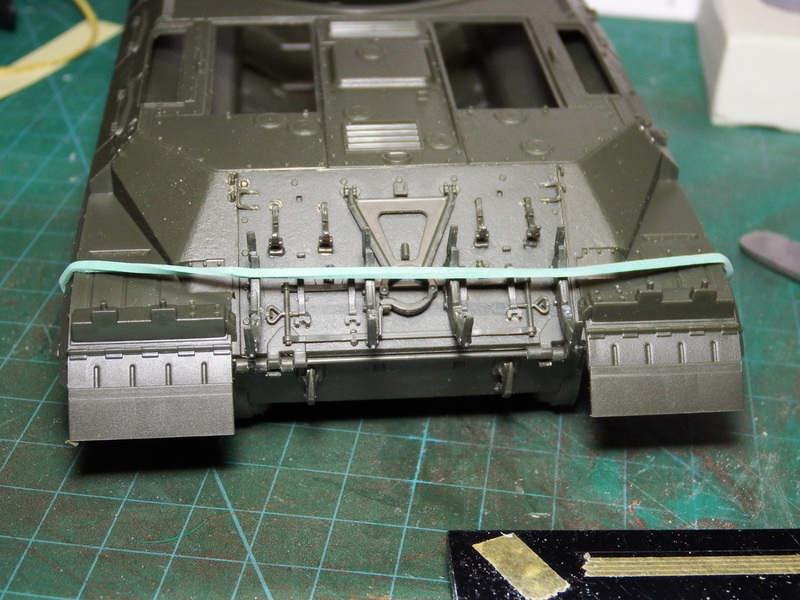 Some removal of plastic is needed here but on the inside lip of the main deck for a snug fit. 12. 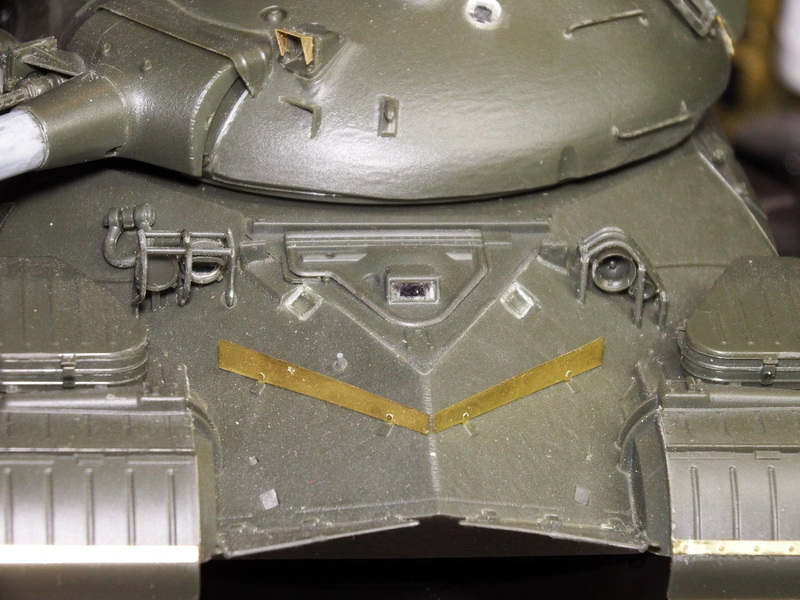 Once you have the hatches fitted (not glued) you can apply the excellent photo-etch parts. This is some of the best PE I've seen recently with almost no snag points. 13. I was asked about the Indy Track and Track Jig on facebook so I took a little detour from the main hull to do these. 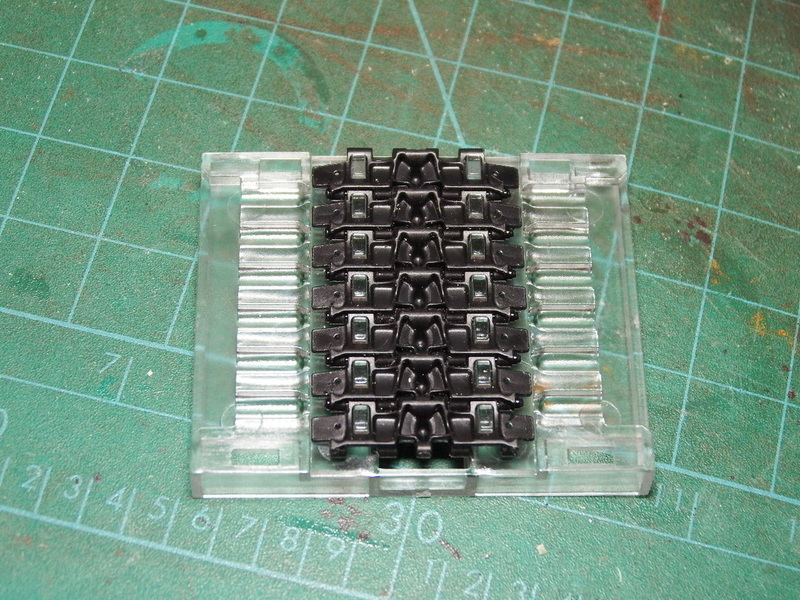 A simple arrangement of 3 parts per link, Track pad, left & right track pins. 14. 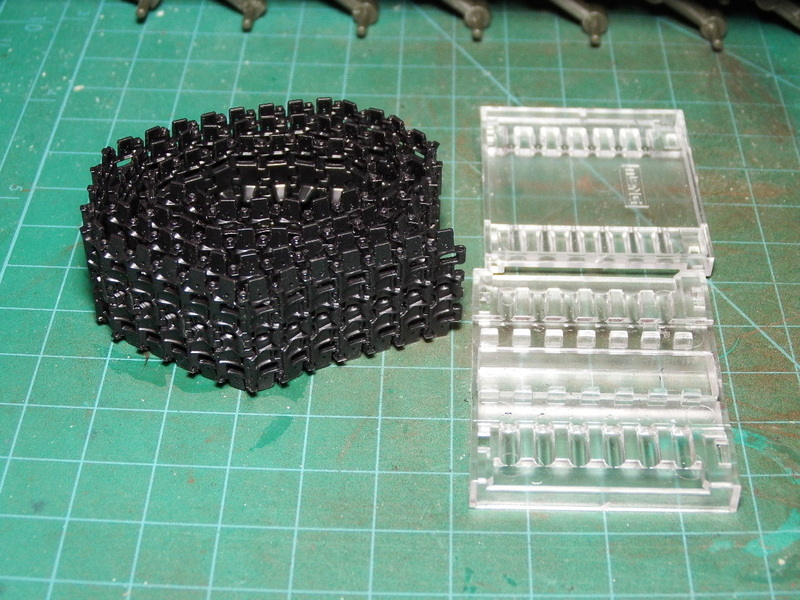 By now I have completed both track runs of 87 links per side using the in-box Track Jig. 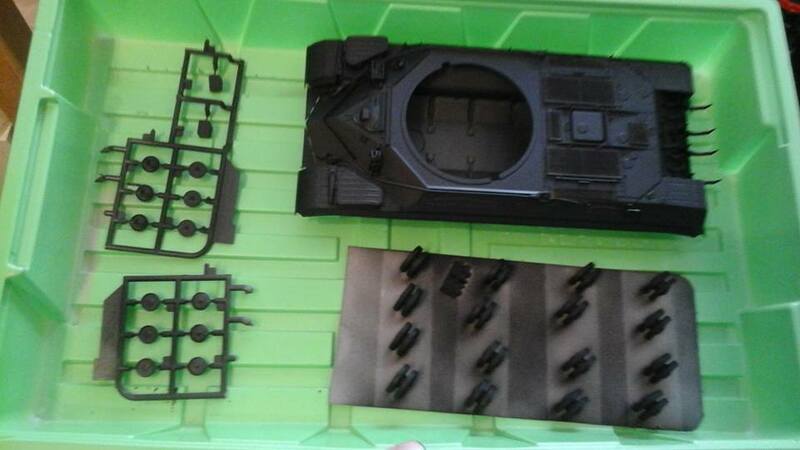 The whole process took 3 hours 20 minutes and has been the easiest track assembly I have ever done - Nice one MENG! 15. 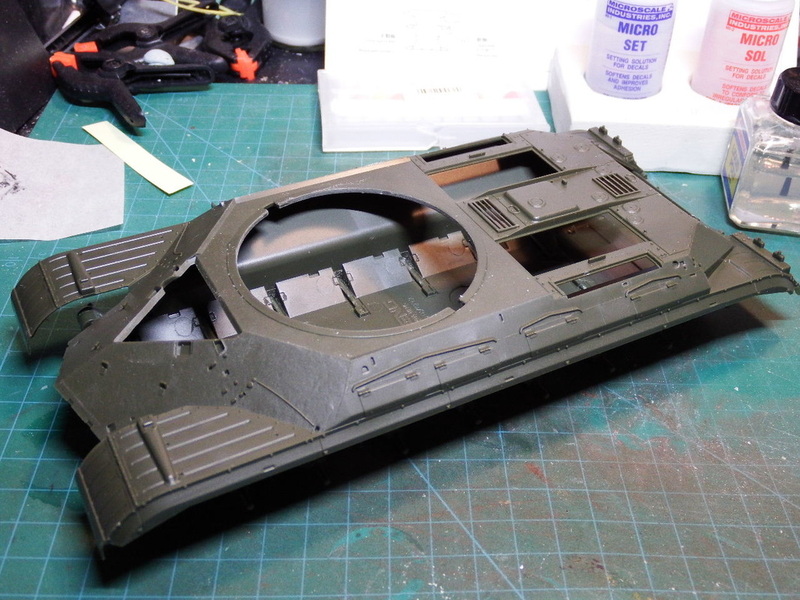 The rear hull area is really coming along now with the 2 rear stowage bins now built and added. 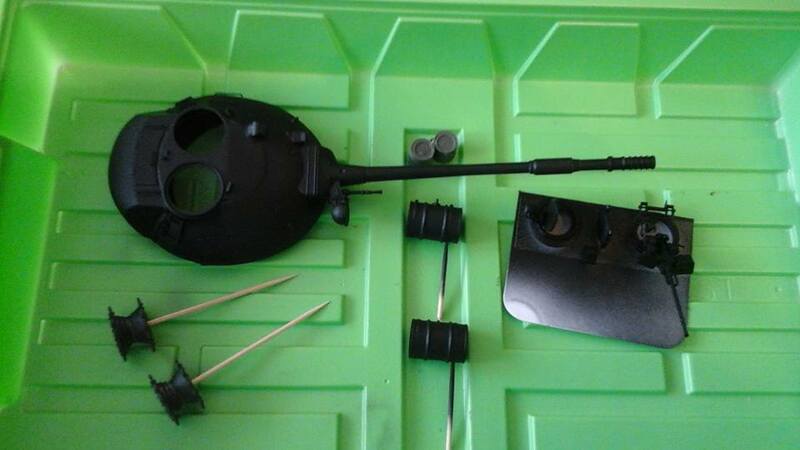 The Smoke generators and rear fuel tanks will be constructed and fitted after painting. 16. 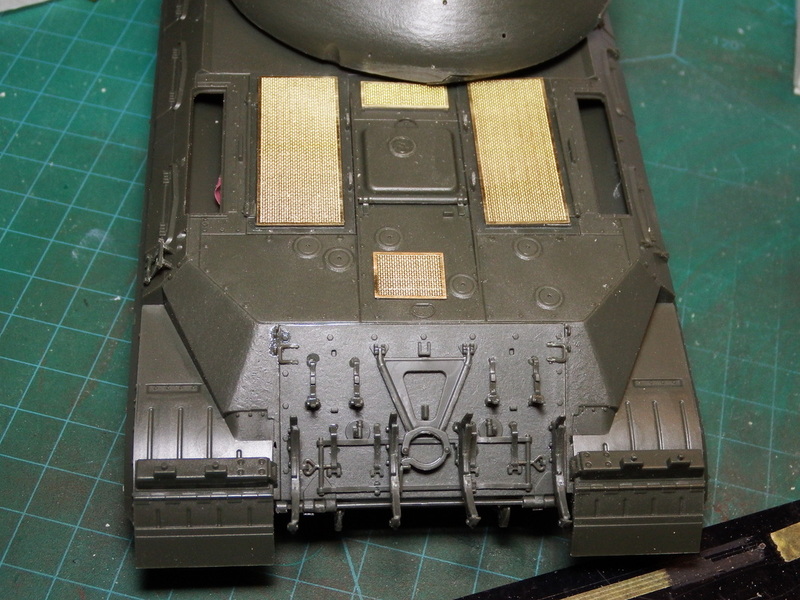 The rear stowage bin has been attached to the turret which took a little persuasion but after removing the locating pins and eyeballing the fit it all came good. 17. 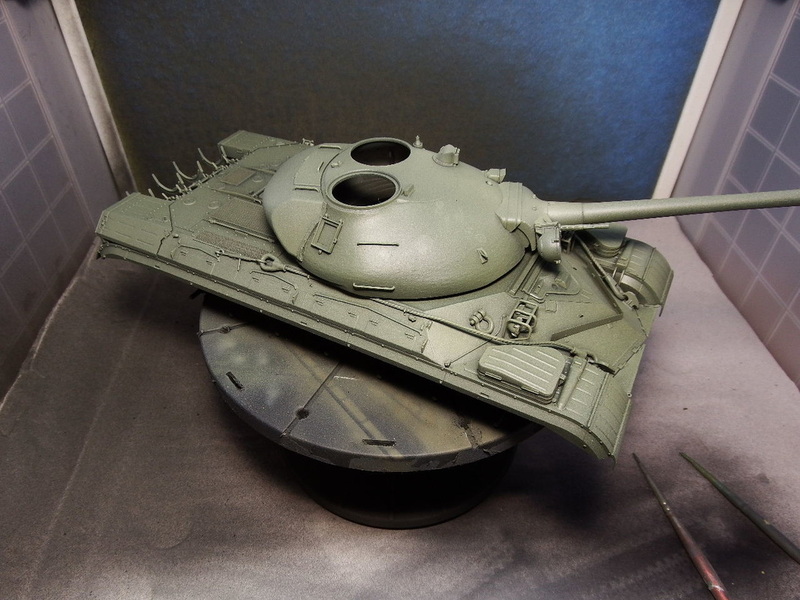 The turret silhouette looks a lot better now. The PE splash guards and mudguard strips are now fitted and the lights, guards and minor fitting are being added. 19. 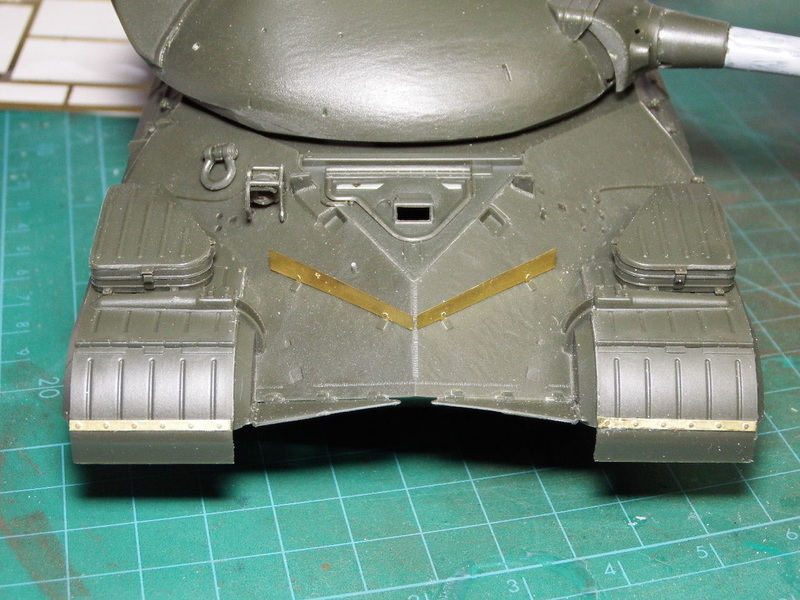 Not previously mentioned are the 2 stowage bins fitted over the front track-guards each comprising 3 parts. 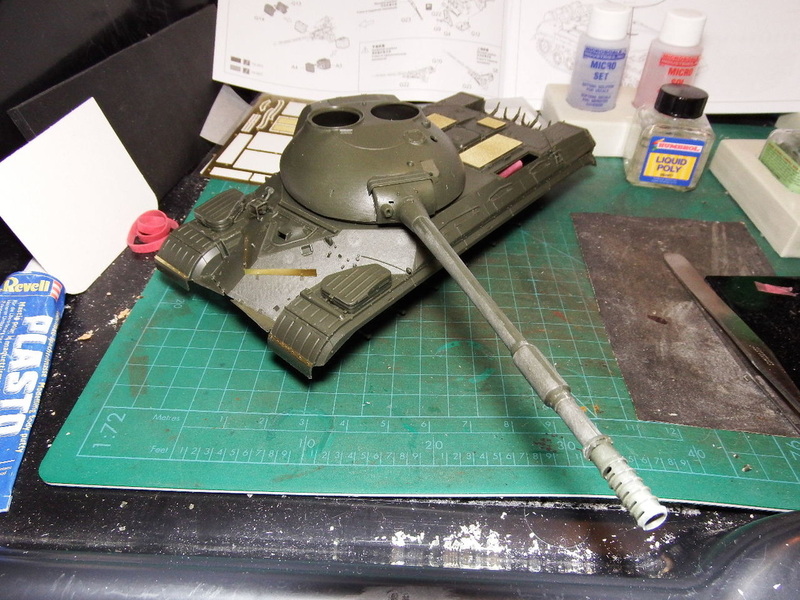 More still to do with plenty of small parts to add. 20. 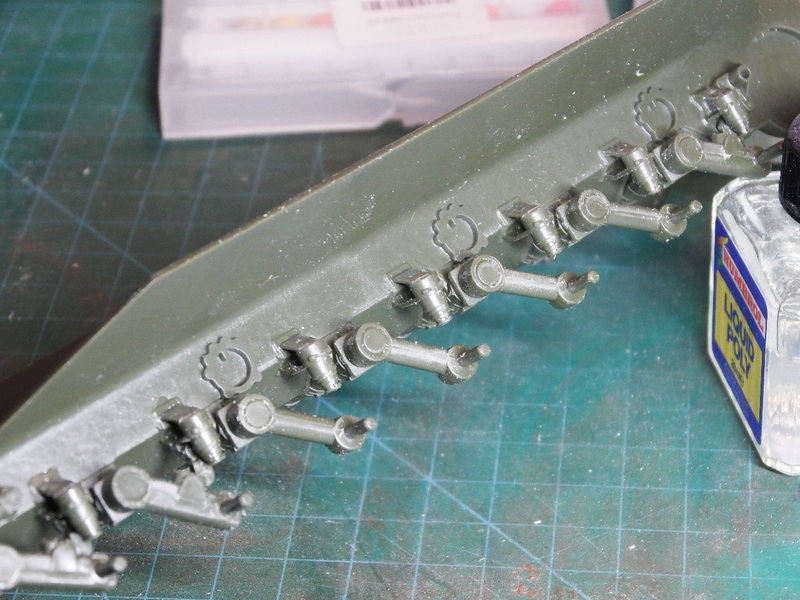 The main gun measures 123mm from the Mantle collar. 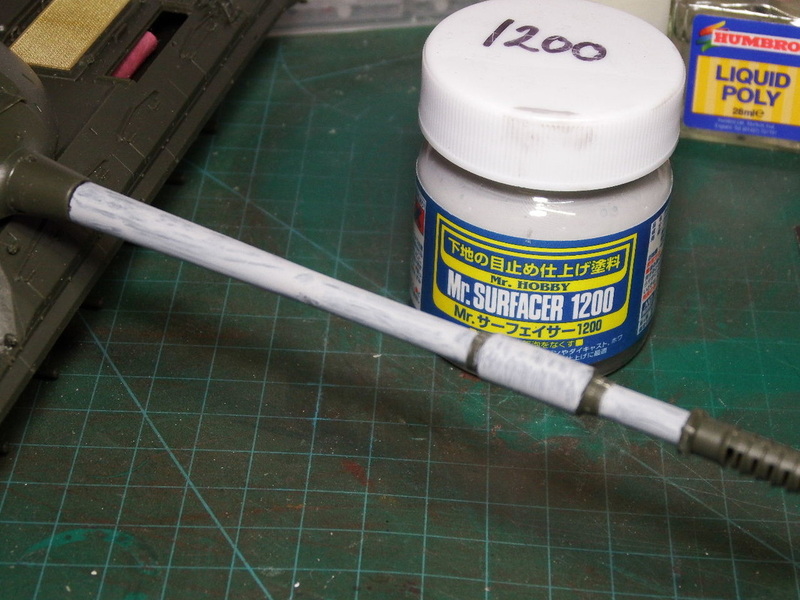 Due to a very slight groove along the barrel I have applied a coat of Mr Surfacer 1200 which I will sand off later. 21. 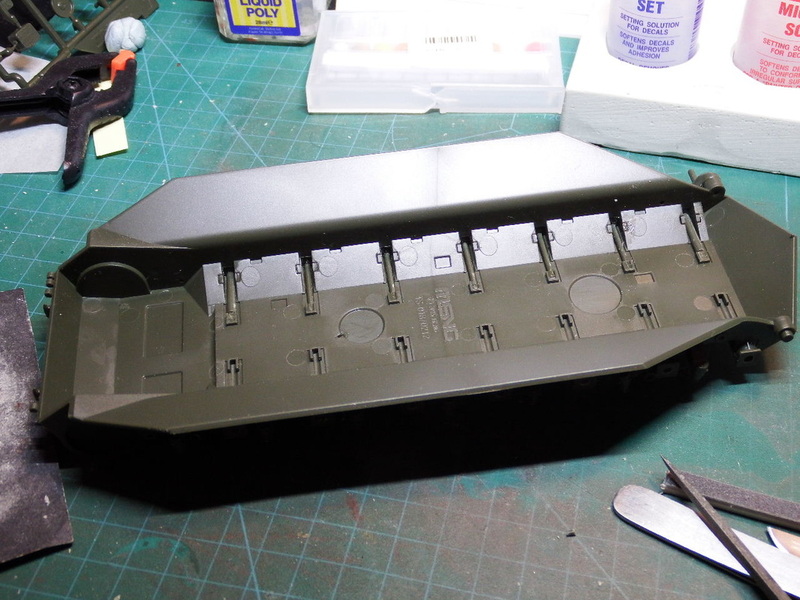 With the addition of the final 17 parts the Commanders MG is now complete. I have chosen the raised position in this case. 22. 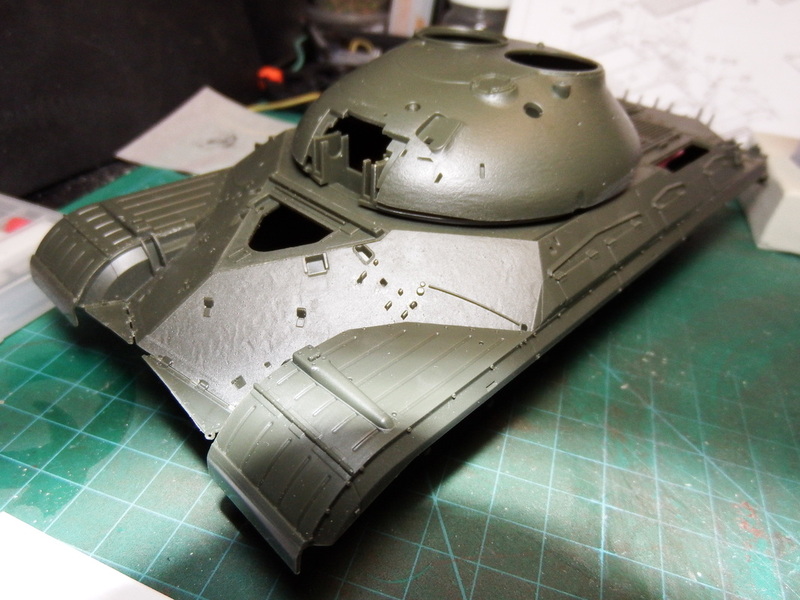 The turret complete with Commanders MG. Whilst fixed to the cupola, the whole fitting is removeable for painting. 23. Full headlight array installed - just the light glasing to do after the painting is done. 24. 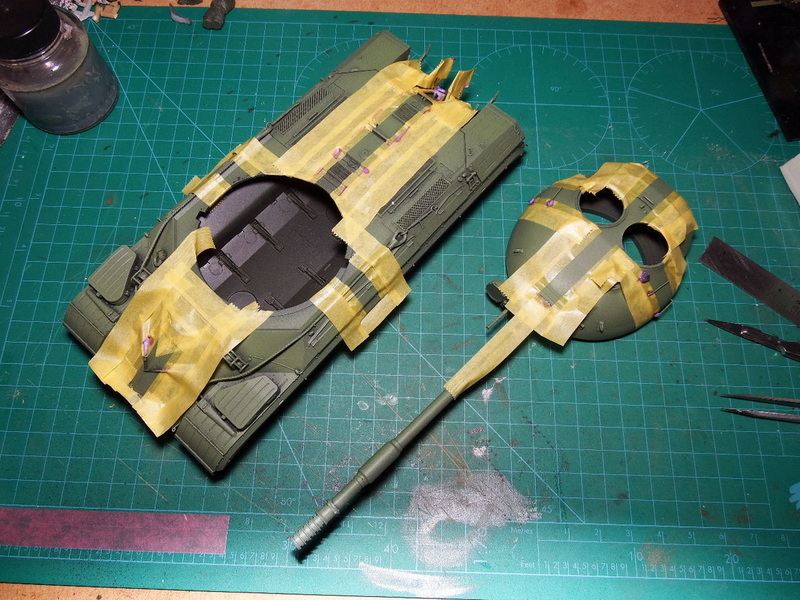 Reserve Fuel Containers and Smoke Generators under construction. These will remain loose for painting. 25. 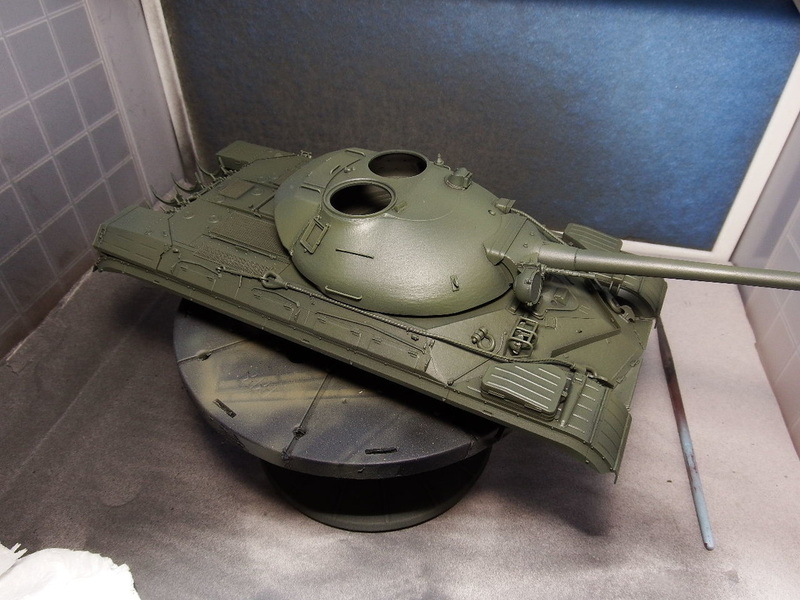 Using my new Sparmax GP-825 airbrush I applied Vallejo Model Air Black, it covers well but uses a lot more paint. 26. Coverage was good but due to the size of the paint hopper (looks to hold about a pint) I was sparing with the colour. 27. 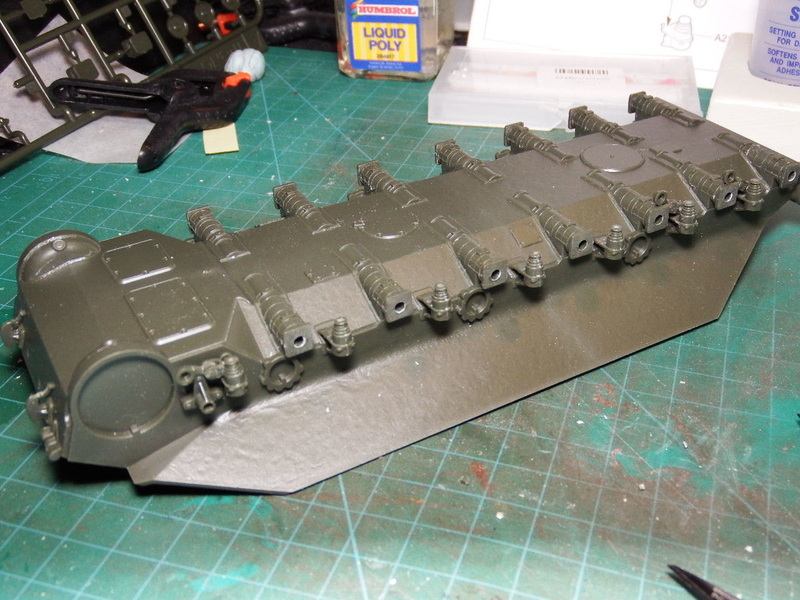 Undercoated and ready for more paint. 28. Hataka! 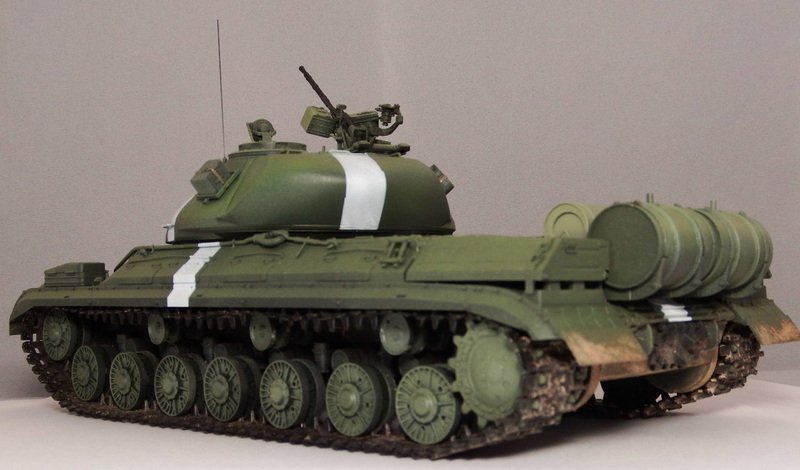 a new paint for me and as I'm doing a Cold War Tank I thought I'd give it a go. A new technique as well. 29. 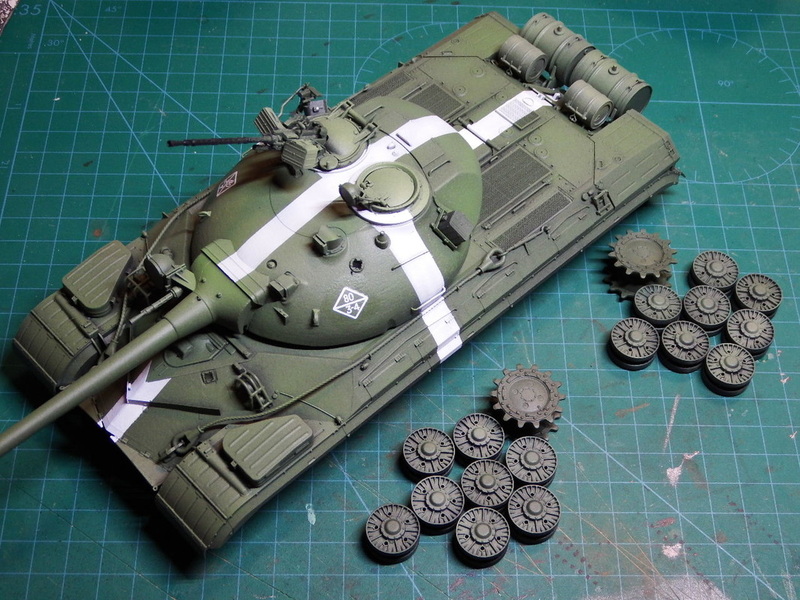 Stage 1: HTK-A111 Warsaw Pact Green Base. 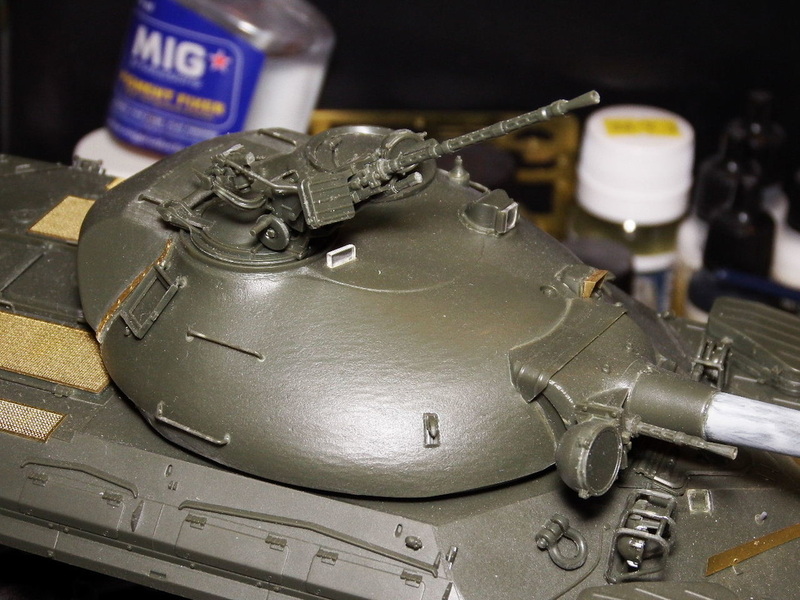 Apply across the whole model as a base coat - I didn't need the Black Undercoat! HATAKA? The colours are fabulous but I, (and it is probably just me! 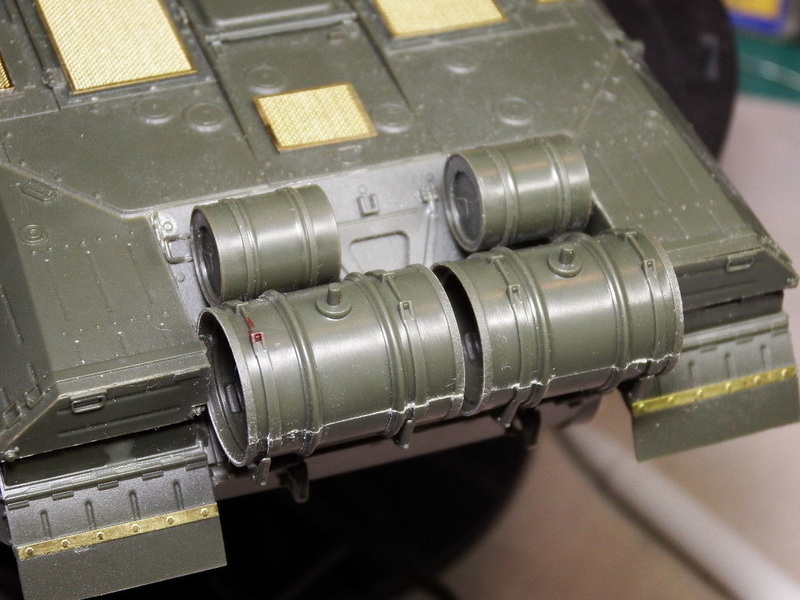 ), have had a few issues with this paint as it has regularly clogged my Airbrushes. I have used it straight out the bottle and with Thinners but, you MUST use their brand for any tangible effect. 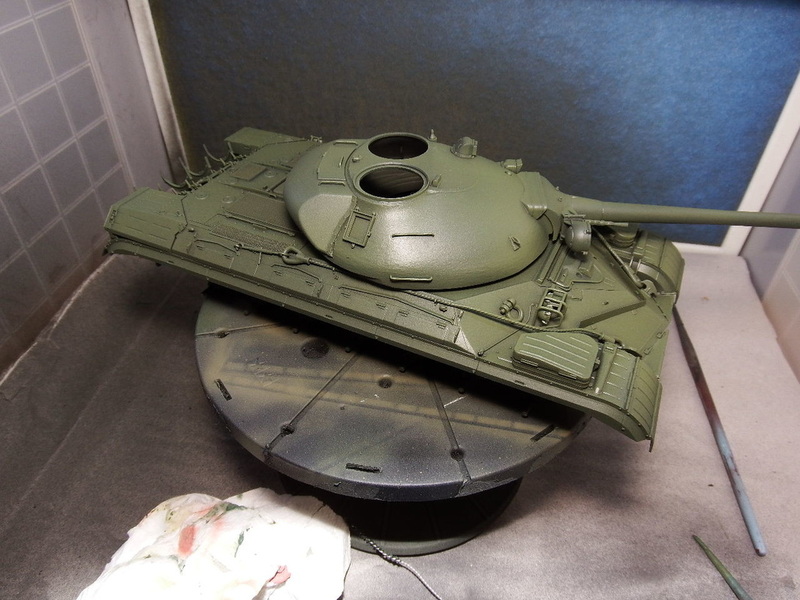 You MUST also thouroughly strip down, clean and service your airbrush after use as this paint has more of a liquid plastic look to it. I have also found it doesn't play well with others - doesn't mix well! 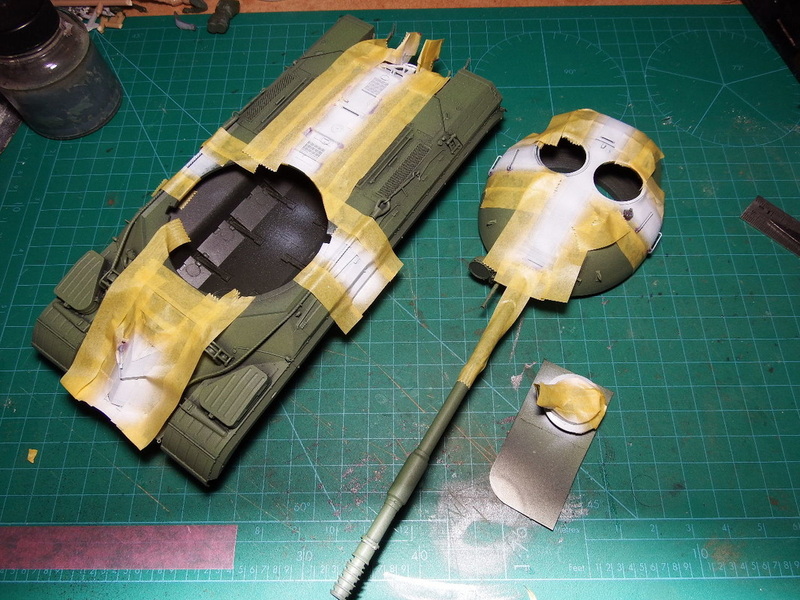 Apparently you should always thoroughly mix Hataka Paint & Thinner outside the Airbrush cup seperately then add it to the Airbrush cup to get a better finish. I had actually mixed the paint & thinner in the cup - Silly me! 33. 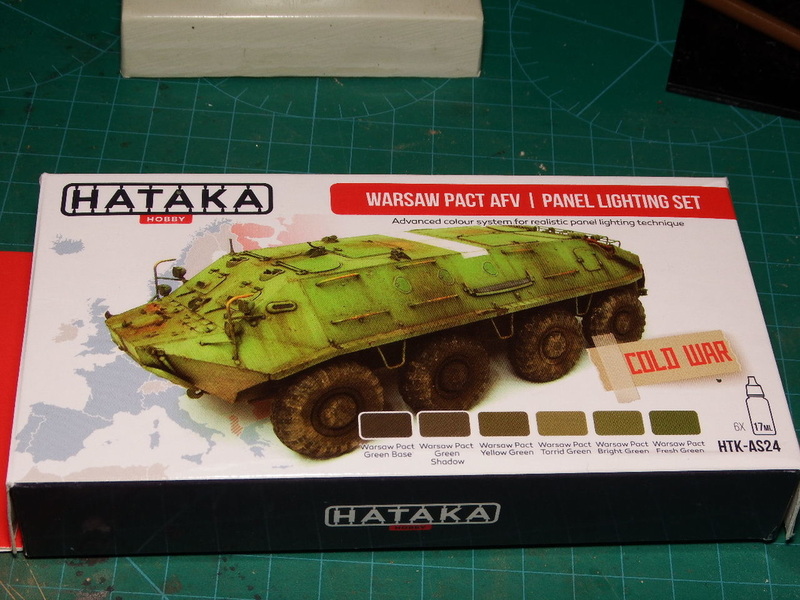 Stage 5: HTK-116 Warsaw Pact Fresh Green. 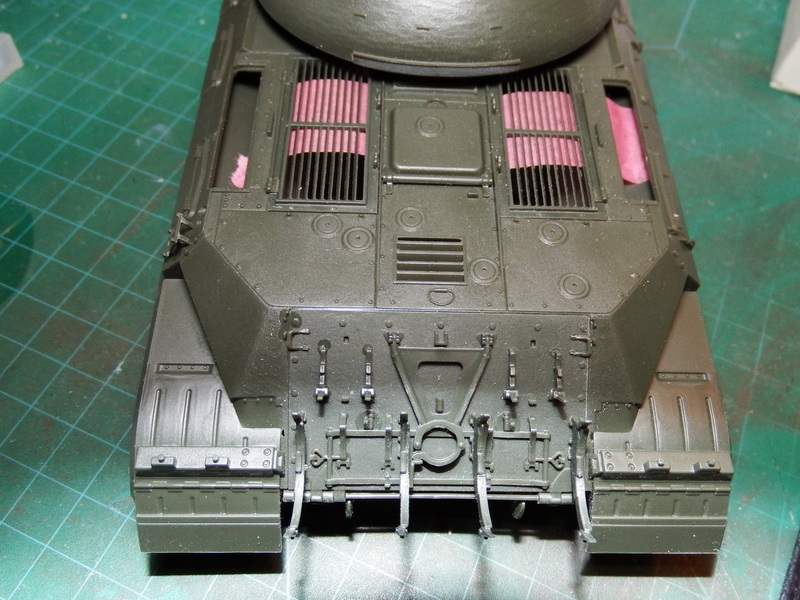 Giving lighter effects to raised areas. Mixed outside the cup too - better! Not completely happy with this but it has been a most enjoyable project so far. 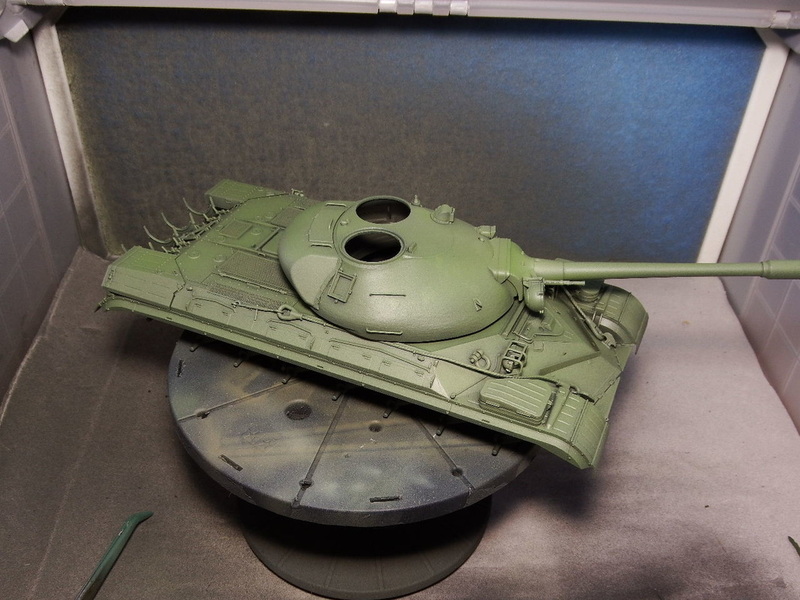 It's now on to the finishing touches and I couldn't leave this monster just in boring old 4B0 Russian Green can I? 37. Ultimately, this came out rather well and whilst I had a few issues I'm very happy with the result. 39. 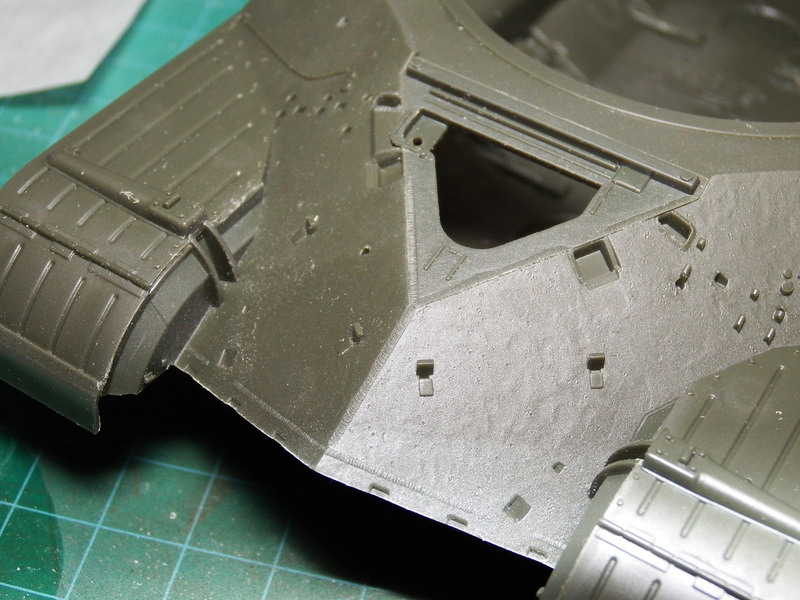 A light weathering was warranted here. On 4th November 2015 I'm calling this one FINISHED!